and he’s a terrific actor whose range is going to be shown here. 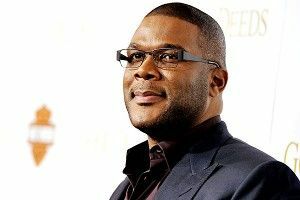 You’re going to see Tyler Perry like you haven’t seen him. He’s 6’5″, he is a linebacker. He is an awesome physical presence and is just going to tear it apart here.” Plenty to pick apart there! But no time, no time. Because in the other corner is an even more unlikely individual: Why, hello, crazy jacked shaved-head serial killer Matthew Fox! Again, you could argue we’ve seen some of this intensity from Fox before, in the nuttier beardo days of Lost‘s Jack Shephard. But then he has to crank his head to the side in a villainous fashion and scuba dive through a building pipe (???) and say bonkers preposterous stuff like “Inflicting pain is a crucial part of my true calling.” In related news: I am totally seeing this movie. Grading the Top 10 Songs ... IN LATVIA!